Every environmentally conscious car buyer wants a Prius. And now Toyota just came out with a new one that looks like a cross between a space shuttle and a computer mouse. Customers, ironically, will be lined up around the block to get one. Sure, it gets amazing mileage, lets folks know you at least care about how environmentally-savvy you look and also manages to drive better than the last one. In 2015, Toyota sold 113,826 Priuses. It's the best-selling Prius on the planet, but not because it's a particularly thrilling car to drive or look at. But if you want serious good looks, great hybrid mileage and really good driving chops, there's another car to consider. It's the Ford C-Max Hybrid ($24,170 base MSRP), a car that's been out since 2012 but for some reason hasn't gained much traction on the market. Last year it sold 21,768 units, a fraction of the Prius share. 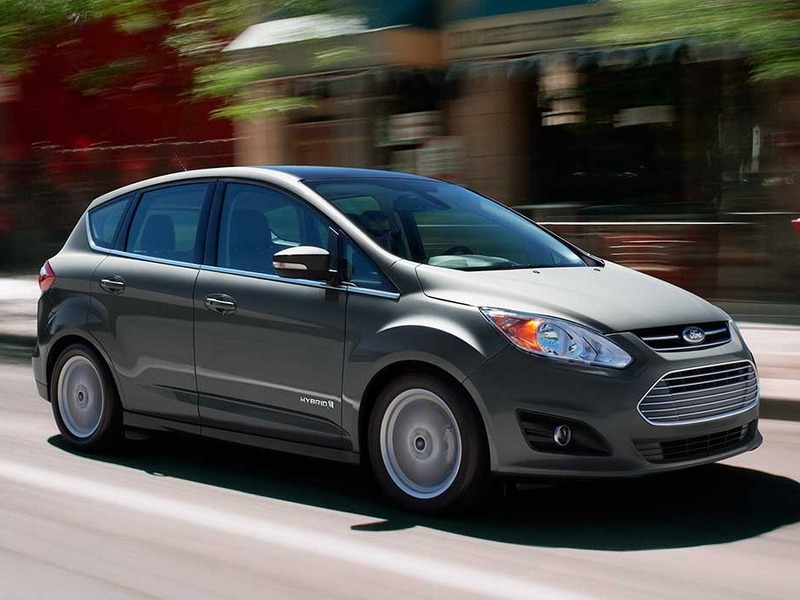 But what the C-Max does that most other hybrids don't do is drive like a champ. It has the Focus chassis, which makes it great in the turns, and the steering is sharp and communicative, something you don't find in this segment. It uses the same powertrain as the Fusion Hybrid, a 2.0-liter four-cylinder engine mated to an electric motor. It produces a combined 188 horsepower, pretty much destroying the Prius's rather tepid 121 horses. And though it doesn't hit the Prius's 58 city/53 highway mpg, it will get 42 city/37 highway with a 540 mile range on a single tank of gas. Those are solid numbers that shouldn't be ignored. What's more, thanks to the 188 hp, acceleration and passing don't feel like chores but deliver solid power when needed. For 2016, the car gets updated with new styling inside and out that's consistent with the handsome Edge, Fusion and Escape models. SE trim comes standard with 17-inch alloy wheels, automatic headlights, cruise control, dual-zone automatic climate control, a height-adjustable driver seat, a leather-wrapped tilt-and-telescoping steering wheel, a 60/40-split folding rear seat, the Sync voice command system, Bluetooth phone and audio connectivity, smartphone app integration (including Pandora Internet radio) and a six-speaker sound system with a CD player, an auxiliary audio jack and a USB interface. Major options on the SE include rear parking sensors, a power liftgate and ambient interior lighting, satellite radio, the Sync 3 touchscreen interface with an 8-inch touchscreen with fingertip swipe and pinch-touch, and a navigation system. The aforementioned equipment comes standard on the upscale SEL, with the exception of the power liftgate and navigation system. The top trim level comes with foglights, automatic wipers, heated mirrors, keyless ignition and entry, an eight-way power driver seat with power lumbar, leather upholstery, heated front seats and an auto-dimming rearview mirror. The C-Max also nails it in the safety department with standard four-wheel ABS, traction and stability control, full curtain airbags and a driver knee airbag. It netted four out of five stars in government crash tests, as well, making it one of the safer hybrids on the road.